In Win, as a high end case manufacturer, are the makers of some of the most uniquely visual designs on the market. Previous designs such as the Star Wars styled X-Fighter, stealth bomber-esque B2 and racing car inspired F430 have certainly caught the imagination offering a very different perspective to the full-ATX case. Superb Expandability: Able to support five 5.25” & six 3.5” drive bays, the Maelstrom has a four CPU M/B compatibility ranging from Micro-ATX to Extended-ATX. User Friendly Ergonomic and Mechanical Design: Designed to provide quick maintenance and upgrade solutions, the patented shock-free railing system protects each drive bay. The retaining holes on the M/B tray offer easy CPU cooler replacement. Superior Acoustic and Vibration Solutions: The Maelstrom offers a quiet environment and silent operation for gamers via acoustic absorbers laid inside the chassis. The tough casing structure efficiently reduces the acoustic noise levels and vibrations. Revolutionary High Efficiency Thermal Solution: Ten front, side, and top 12cm fans enhance airflow while a meshed front and top panel provide superior ventilation. 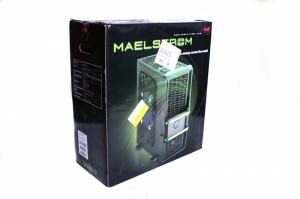 The Maelstrom offers an unparalleled thermal solution for any gaming system. Luxurious Exterior and Interior Painting: Fully draped in a dark metallic black, the Maelstrom offers a luxurious look with its intimidating size. The black coating on the exterior and interior of the chassis prevent damage from humidity, oxidation, and extend the lifespan of the Maelstrom. The Maelstrom arrives in a suitably sized, glossy black cardboard box featuring a large image of the case surrounded with a green swirl. A manual sits atop the enclosed case with the main accessory bundle contained with a plastic bag. 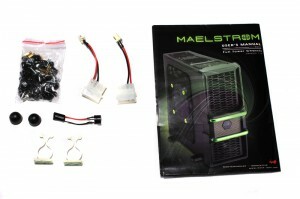 The contents of which include a variety of screws and standoffs as well as a couple of molex (4-pin) to 3-pin fan header adapters. 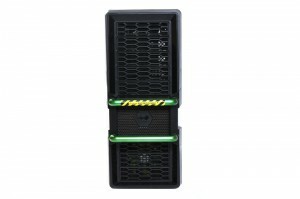 With the installation of all the drives involving rails, a pre-installed 5.25” tray holds all the rubbery, fluorescent yellow rails for both the hard drives and DVD drives. The rail storage tray takes up one of the five 5.2” external drive bays but is easily removable to add extra optical drives or other devices. The externals are not only unique but also very distinct; one’s attention is immediately drawn to the green bars that bend around the front of the chassis and one would probably assume them to be carry-handles. However, a sticker acts as a disclaimer indicating that the “bars” should not be used as handles due to the front bezel not being attached to the main body strongly enough in order to support the whole weight of the Maelstrom. Consequently, the green bars serve no other purpose than their visual aspect which, as In Win have demonstrated in previous enclosures, are a little abstract. The two sides differ in that one has a metal meshing behind which a large 220mm intake fan is housed whilst the other is left plain serving just to cover the cabling behind the motherboard tray. 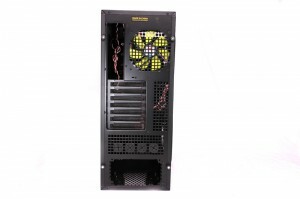 The 220mm side fan is interchangeable with up to six 120mm fans (N.B. 120mm fans for the side panel are not included) in two columns of three. 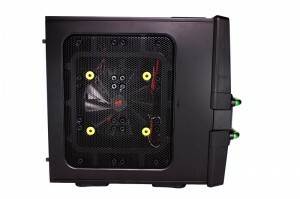 All the mountings for these fans feature rubber grommets so as to prevent the transfer of any vibrations to the chassis helping to reduce noise. Another of the ten 120mm mounting slots is positioned at the rear adjacent to the motherboard I/O plate and above the seven PCI slots. 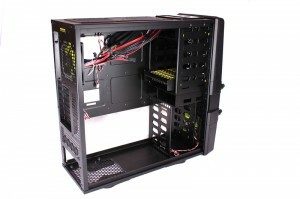 A bottom-mounted power supply is also featured below four grommet-filled holes for water cooling purposes (note that the holes are capable of supporting up to ¾” tubing). The inclusion of dual eSATA connections is definitely welcome due to the superior data transfer speeds as well as an old-school Firewire port. 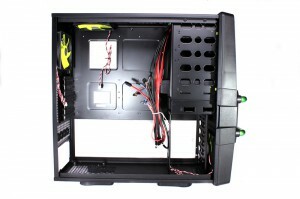 The last outer face of the Maelstrom is the underneath comprising of four rotatable feet and an air vent under the PSU slot to allow hot air to escape. Upon removing the side panels via a couple of thumbscrews, the foam insulation around the meshing on one side panel and on the bottom half of the other panel catches one’s attention. In place to act as a noise dampener it’s a nice touch although the extent to which it is effective is questionable considering the large meshing area that isn’t likely to absorb much sound. Looking at the build quality, the chassis has a pleasing rigidity to it down to the steel construction and plastic feet which, especially when set perpendicular to the enclosure, make for a stable base. It has to be said that the internals of gaming chassis’ have since evolved greatly from the rough, grey metal, almost unfinished look with sleek, matte black visuals repeated internally and not just externally. 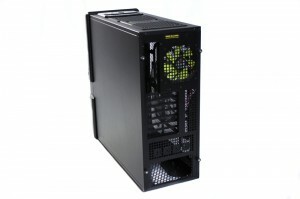 Indeed this is the case with the Maelstrom providing a much welcomed professional finish. Another feature, now seemingly fitted as standard to most gaming enclosures, is a small cut-out in the motherboard tray allowing a backplate (for a processor cooler) to be fitted without requiring motherboard removal. Unfortunately this is the only hole to be found in the motherboard tray; a few others would have been useful for cable management purposes allowing access to the top of the motherboard from behind the tray in order to reduce the tangle of cables in the main chamber. 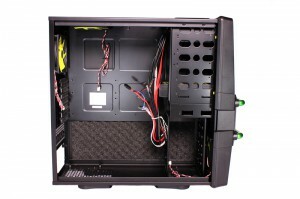 Still, the whole bottom section is left open providing easy access to the drive bays at the front of the case with cables able to be tied to the floor using the provided ties and plastic clips. The cooling system, expandability aside, consists of three 120mm fans: two of which remove air from the chassis and are located at the back and top of the Maelstrom; and one situated in front of the hard drive bays drawing cold air in. A much larger 220mm fan is attached to the side panel complete with blue LEDs but note that a switch does allow the lighting to be turned on/off. All the 12cm fans are fluorescent yellow in colour consistent with In Win’s ever-so-slightly eccentric visual appeal – it does make a nice change from the countless black fans on the market I might add though. 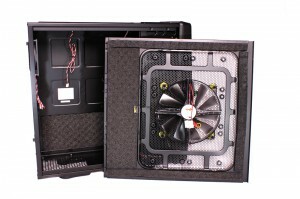 A total of four fans is perhaps the typical amount of fans included with a gaming enclosure yet, as mentioned previously, few other chassis’ have the expandability of the Maelstrom with up to ten 120mm fans catered for providing a much greater combined airflow as well as offering visual customisation in the form of LEDs, coloured impellers and the like. With air cooling covered, let’s move on to liquid cooling: double the standard number of water cooling holes are provided and although many water-cooling enthusiasts will have fully internal systems or only require two of the holes, four allows for dual loops to be used in unison. This is particularly useful if a particular rig has multiple water-cooled graphics cards besides water blocks on the CPU and chipsets and thus an excess of components for just a single loop. 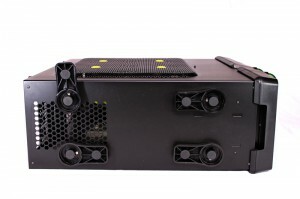 The power supply mount is at the bottom of the chassis with an air vent below and four rubber feet for the unit to sit upon in order to prevent vibrations from transferring to the main body and thus amplifying. Whilst on the topic of anti-vibration mechanisms, all of the fluorescent rails, used for installing all types of drives, are manufactured with a rubbery texture too for the same reasons as explained above. In terms of the actual installation, the rails simply clip either side of the drive allowing it to slot into the allotted bay and lock into place: pinching the ends of the rails inwards releases the drive once more. All other parts of the installation process follow a familiar pattern with the motherboard, GPU and other PCI devices and power supply all secured via screws making for a quick and painless installation overall. Cases are interesting pieces of hardware to test in that there are no set benchmarks to test an enclosure’s “performance”. Therefore, to test cases here at Verdis Reviews we test a wide range of factors to ensure they are fully put to the test. These include: strength, cooling, noise and cost. Please note that some areas of testing, aesthetics for one, are very subjective and many not reflect your own opinions. The main steel body has a definite rigidity and certainly presents a strong core unit without any flexing or bending when pressure is applied. However, the front bezel is constructed entirely from plastic and simply clips on to the main chassis. Although the plastic appears to be quite strong, we’d prefer a metal-based front panel. The four-fan cooling system included as standard should provide adequate combined airflow to effectively remove hot air as well as draw in cold air. However, for high-end gamers and enthusiasts with more demanding rigs and overclocked components, the ability to significantly bulk up the amount of fans contained within the Maelstrom is a definite bonus. It has to be said that the scale of expandability in the cooling department is not paralleled by many cases on the market so full marks go to In Win here. Noise wise, the fans are audible and are definitely louder than we would like. Despite this, they are not overly loud and if you’re not a silent enthusiast or concerned greatly over noise, it shouldn’t a problem. 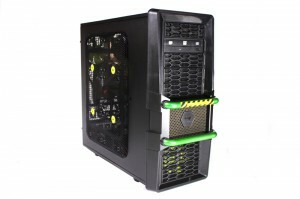 At £90, the In Win Maelstrom is a very advanced gaming chassis with an array of features unmatched by many cases sub-£100. The In Win Maelstrom as a gaming chassis has a lot going for it: the array of fans and extent of the expandability for increasing the overall cooling system is second-to-none with up to ten 120mm fans able to be utilised. The installation is simple and straight forward to follow and although perhaps not the most innovative with screws used for the GPU and other components, the rails are very well manufactured making for extremely fast drive installation and removal whilst dampening vibrations as a result of the rubberised texture. This attention to detail in the anti-vibration department is consistent throughout the design with feet below the PSU and foam on the side panels. However, this is negated by the perforated metal which will not absorb noise. 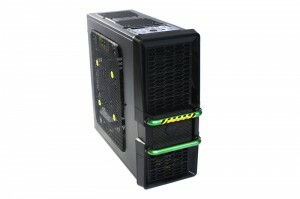 Although the Maelstrom is not styled around a particular concept as previous In Win chassis’ have been, the visuals are still a very defining aspect of the chassis with the stand-out green bars and overall unique appearance making for a love/hate feature depending on the user. 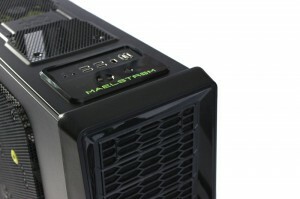 The case unquestionably stands out and with the high level of cooling, easy installation and well laid-out interior, the Maelstrom is a very appealing gaming enclosure at £90 but the visuals are ultimately a deciding factor. 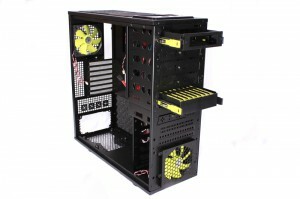 Thanks go to In Win for providing the case for review.